Three winter months are not only endless snow fun and New Year holidays. This is the time when it is easier for a child to catch a cold or flu. Here are some effective ways to help the parents avoid this. For children of all ages, garlic is a reliable protective measure against ailments and diseases. Older children can eat a clove at dinner. For the youngest, there is an old proven method: the head of garlic should be divided into cloves, peeled and cut into pieces, strung on a string, making peculiar beads. These beads need to be hung near the crib, where the baby sleeps. The room where the child sleeps and plays should be carefully aired several times a day. 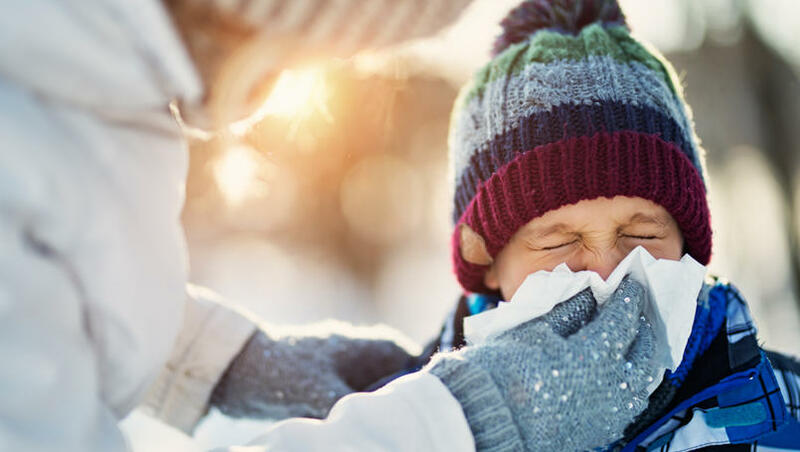 Fresh frosty air is the main enemy of viruses and infections. Remember that, ideally, the temperature in the room shouldn’t be higher than 22 degrees, and the humidity should not be lower than 45 percent. Special attention should be paid to the child’s nutrition during the cold season. The children’s and adults’ diet in winter becomes more inadequate than in summer. Especially the body lacks vitamins and other nutrients contained in fresh fruits and vegetables. Try to feed the child exclusively with natural products. The lack of fresh fruits and vegetables compensate for apple and carrot puree, natural juices, compotes, decoctions of dried fruit. Frozen vegetables from reputable manufacturers will also help you diversify and improve the child’s diet. Boil or steam meat and fish. Treat your child with honey, citrus, persimmon, bananas, buy or cook yourself fermented milk products. In some cases, your baby may need a vitamin complex, but before going to the pharmacy, consult a pediatrician! In winter, a child (adults too) should drink more fluids. Warm teas and clean water should be drunk daily in sufficient quantities. Water balance conservation makes the body more resistant to negative external influences. At the same time, it is worth paying attention to the choice of drinks: instead of black tea, at least from time to time, give your kid green (it is healthier), you should also try chamomile and lime tea, herbal infusions. If your baby has weak immunity and is particularly susceptible to the flu and SARS, it may be worthwhile to resort to medication prophylaxis. It is important to remember about possible side effects, so you should consult your doctor before starting medication. For little children, prophylaxis is carried out with the help of interferon inducers - substances that help in the synthesis of its own interferon protein, which fights viruses. They are available in various forms - candles, drops, pills or ointments. It is very important for your child to be outdoors every day. Walking outside, especially in mild frost or snowy weather, is much more useful than sitting in a locked room, full of microorganisms. Do not wrap the child - it is only important to ensure that his feet were warm and dry. In order to be healthy and strong, and to make the immunity successfully cope with attacks of viruses and bacteria, the child needs to be tempered. There are many opinions on how to do this correctly. It is equally important to do exercises. A small set of exercises that your baby will do regularly will significantly increase your chances of dealing with a cold. Both children and adults breathe exhaust fumes on the street. Particles of dirt settle on clothing and hair. Together with them, a person brings with him into the house endless hordes of microorganisms. Change your child's clothes regularly, do not let him walk in a street suit at home, bathe daily, wash his head more often. In addition, carefully watch that the child does not go out in the cold sweat. Once on the street, the body instantly cools down, and as a result of a sharp temperature drop, the child may get sick. The last point may cause bewilderment and surprise among many parents. Nevertheless, the fact remains true: cheerfulness, vitality, good mood make the child almost invulnerable to diseases. And adults should follow the example of children who carelessly rejoice in the world around them every day.